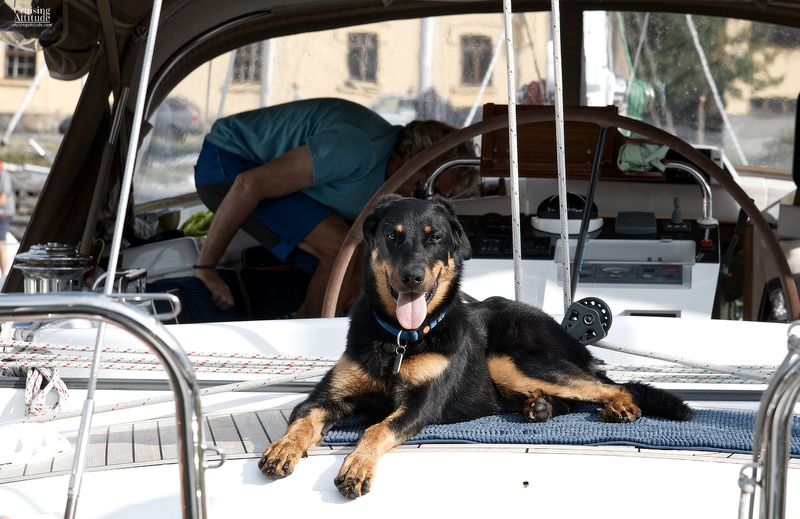 We’ve been cruising with big dogs since our first season on Freja. Senna was with us until July of 2017 (she died of old age while we were in Stockholm) and we’ve had Mika onboard since the end of April 2018. Mika was born on September 24, 2017. 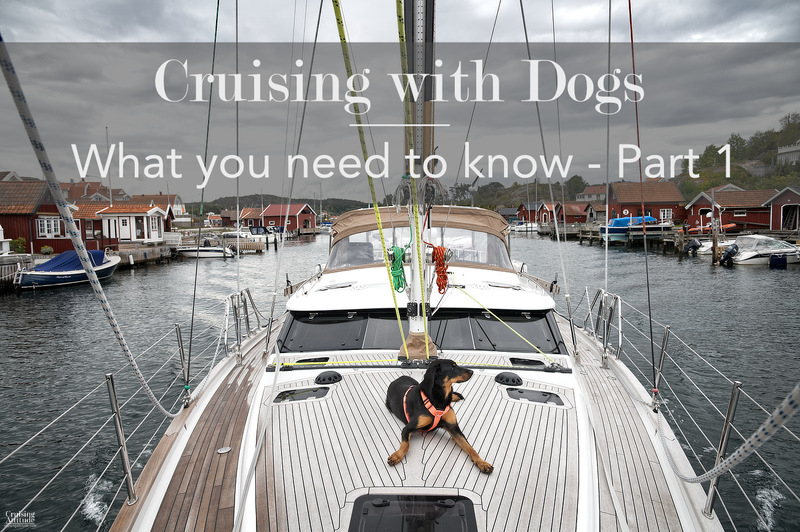 Cruising life is admittedly a bit more difficult and complicated with a dog, but it is so worth it! Most large dogs have no problem getting on the boat, especially if you have a gangway. Our gangway has a non-slip surface and is made of carbon fiber, so it’s easy to fold up and carry to our workshop, where it’s stored. When I lived in Stockholm and sailed a Sveakryssare (a low and narrow 36-ft sloop) our Flat-Coated Retriever would leap from the pontoon, through the bars of the pulpit, onto the foredeck. Amazing. This non-slip gangway makes it easy for Mika to get on the boat when we can’t get an alongside berth in a marina. This is the Navis Boat Club Marina in Stockholm. 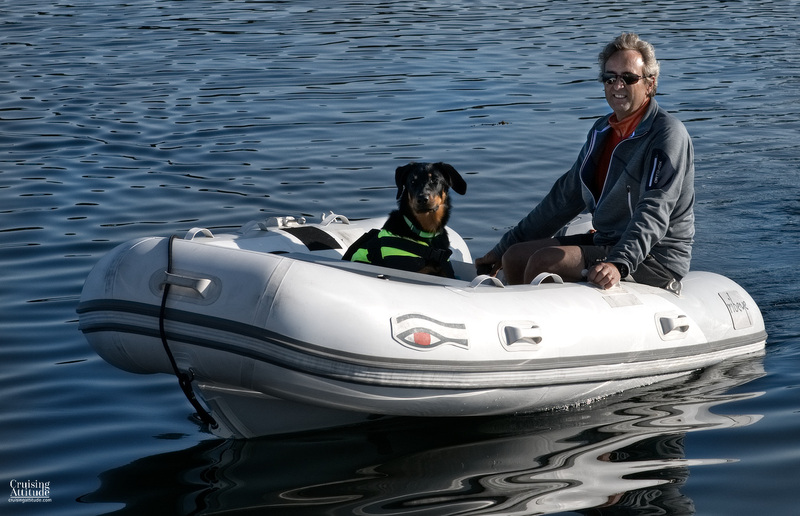 The big problem is getting your large/heavy dog into the boat. We chose our boat, which has a raised saloon, partly because it’s easy for a dog to get into the saloon from the companionway. We have just three wide stairs that go down at a 45 degree angle – they’re like the stairs you have in a house, rather than like a step ladder. 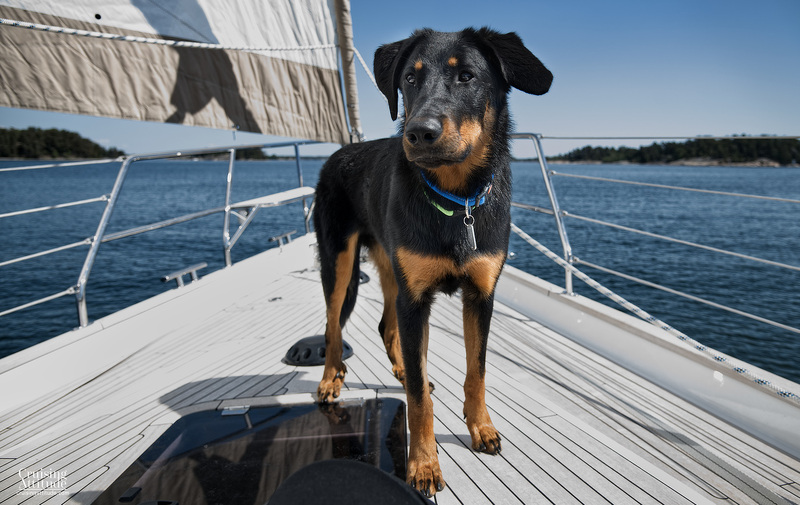 If you have more of a step ladder entrance into your boat, you’ll probably have to either modify the stairs so they’re less steep and wide enough for the dog to comfortably walk down, or rig a block and tackle “crane” from the boom to winch your dog down. 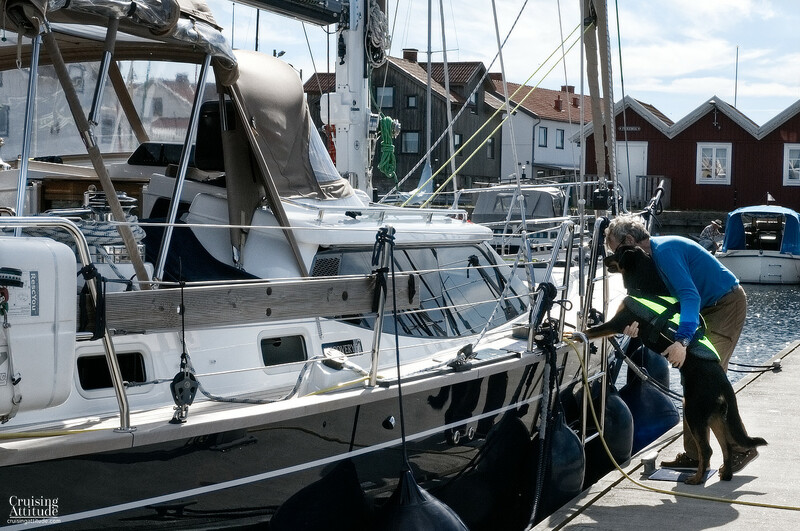 Helping Mika onto the boat at the Knippla-Källö Marina on the west coast of Sweden. This was taken when she was 6 months old. She now just jumps right on. When Mika is lying down, stretched out to her full length, she takes up basically all of the floor space in the saloon of our 55 foot sailboat. She also likes to sleep on one of the cockpit benches while under way (taking up almost the entire length of it). If it’s just the two of us, it’s no problem, but when we have guests on board, it gets a bit crowded. You will vacuum every single day. Sometimes twice a day. We invested in a Dyson hand-held chargeable vacuum cleaner. They are more expensive that other brands, but the quality and power are so much better. We went through 2 other brands before finally being satisfied with the Dyson. We brush Mika every morning as well. In the spring, we leave her soft fur in the forest for birds to build their nests, but after the nesting season we put it in the trash. In the summer, when she’s really shedding, it’s enough to fill a pillow every week! Mika likes to sit on the aft deck to watch people go by. This is taken at the Turkku Marina (Finland). It was 33°C and about 95% humidity while we were there. The summer of 2018 went into the record books as being the hottest and most humid summers in history in the nordic countries. We had about 5 straight weeks of over 30°C and high humidity during July and the beginning of August while we were in Stockholm, Åland and Finland. We let Mika swim several time a day if it was possible. The only place where it was possible was in Turkku, since the marina is up the river Aura that runs through the city. We’re lucky enough to have air conditioning, and when we have to leave Mika on the boat to go grocery shopping (no dogs allowed), we put her inside and run the air conditioning at about 22°C. We also have insulated canvas tarps that we fix over the saloon windows to keep the heat out (one side is Sunbrella and the other is felt). We also make sure she has plenty of cool water. She has a cooling bandana and we may buy her a cooling vest if climate change means permanently hot summers in Scandinavia and the Baltic countries. We love to anchor out if it’s possible. The feeling of peace and tranquility at anchor is a natural form of Prozac. Mika loves to anchor out because that means swimming! It also means exploring the islands around the anchorage and experiencing new sights and smells. It’s obviously not possible to do this without a dinghy. Make sure you have one that’s big enough — Mika takes the space of two adults! Mika loves to be in the dinghy. Sometimes she’ll jump in to have a nap. You’ll probabally have “treats” in addition to “normal” food. We usually buy grain-free food for small dogs and use those small nuggets as our “treat/training food” so Mika won’t end up gaining too much weight. She’s heavy enough as it is! 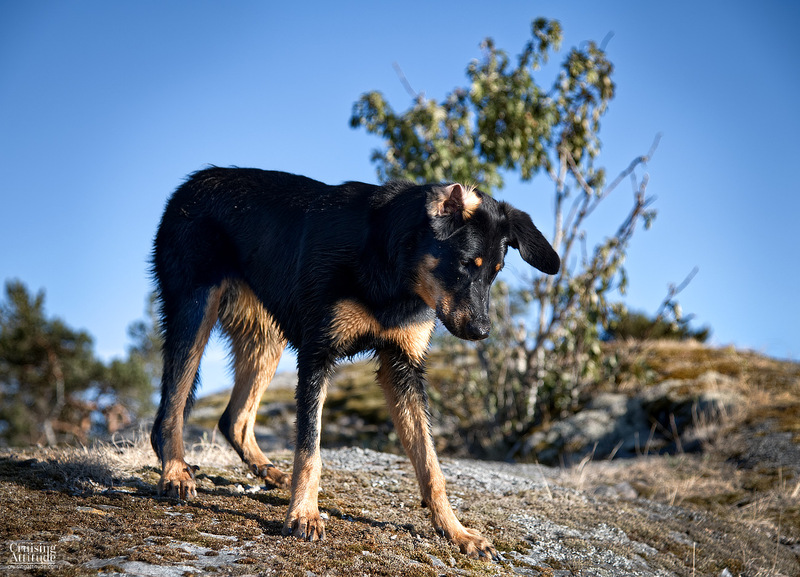 Train your puppy to eliminate on deck. If you’re at home, train her to eliminate on the terrace, balcony or porch instead of on the grass. This will translate into the deck once your puppy is on the boat. This worked perfectly for Mika and she will walk up to the foredeck to take care of her needs. We then wash the deck off with our anchor wash hose, or a bucket if we’re at anchor. Number 2’s go into a poop bag before we rinse the deck of course. Senna, who was already 11 years old when she came to the boat, was never able to eliminate onboard. When she was a puppy, we had no plans whatsoever to go cruising so she was trained to “do it on the grass.” We tried with a piece of artificial grass, but that didn’t work. We also tried pee pads with her own urine sprinkled on it. That didn’t work either. So with Senna, we had to limit our sailing to around 5 hours a day. Mika has no problem eliminating on the foredeck. Afterwards we rinse the deck with our anchor wash hose or a bucket.